What was that I said about the end of rotten things? Well, this may not qualify as rotten, but it's certainly inconvenient. The power supply fan on my server has failed. This explains why the server unexpectedly rebooted yesterday, and froze up today. 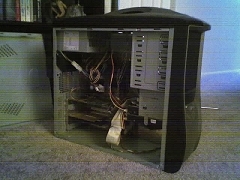 I've pulled it into the living room, opened it up and blew as much dust out as I could. The apartment thermostat is now down to 72, and may be pushed lower, but thankfully the hardware is about five years old and doesn't require the same cooling as newer stuff. Is this a big deal? Well, yes, since I host my own email and web server. If you're reading this page, things are currently working. Tomorrow I have to pick up a new power supply. Hmm. I wonder if I can transfer my email and web services to my laptop for a while--especially email. Laugh, consultant, laugh...though your heart is breaking!